There is a time for love, and let me explain. As you may already know, there is the right time for all things. There is a real window of time for everyone to meet someone to fall in love with. To find the true mate of your soul. Ecclesiastes Chapter 3 says it very well: 1. To every thing, there is a season, and a time to every purpose under the heaven:. Astrologically there is a perfect time to find your soul mate. The Magi Astrology™ calls this your Cinderella Time. This is the time when you can meet your prince charming, fall in love and get married, and live happily ever after. It is the same for men as it is for women that this is your time to find that special someone. This is based upon the transits which are the key to knowing your time for any kind of endeavor. This window is only open a few times in your life and they don’t last long, so when they are there, that is the time to take advantage of it and to actively find your love. Whether you are already involved with someone and wanting to move things into a marriage or you are looking for your love, this is the time to take action. This is the time to push a little bit because this aspect will help you. Now, I know what you’re thinking and if the person you’re pushing doesn’t stay in your life because you pushed, let them go, they were not the right one for you because of Mr./Ms. Perfect will be the one that is just as eager as you to tie the knot. In my own instance, I would push and if they start backing up then that is all I needed to know that they were not the right one. Take a look at this Magi Astrology chart in which I’ve eliminated all other planet transits except those which show the Cinderella Times that I am currently under. Yes, in fact, yours truly is definitely in a Cinderella Time. Please note that Magi Astrology has a very tight orb for aspects which are no more than 3 degrees in the longitude and no more than 1.5 degrees of the declination. You will see two Cinderella Times, which include transiting Chiron conjunct my natal Venus and transiting Neptune parallel my natal Chiron. 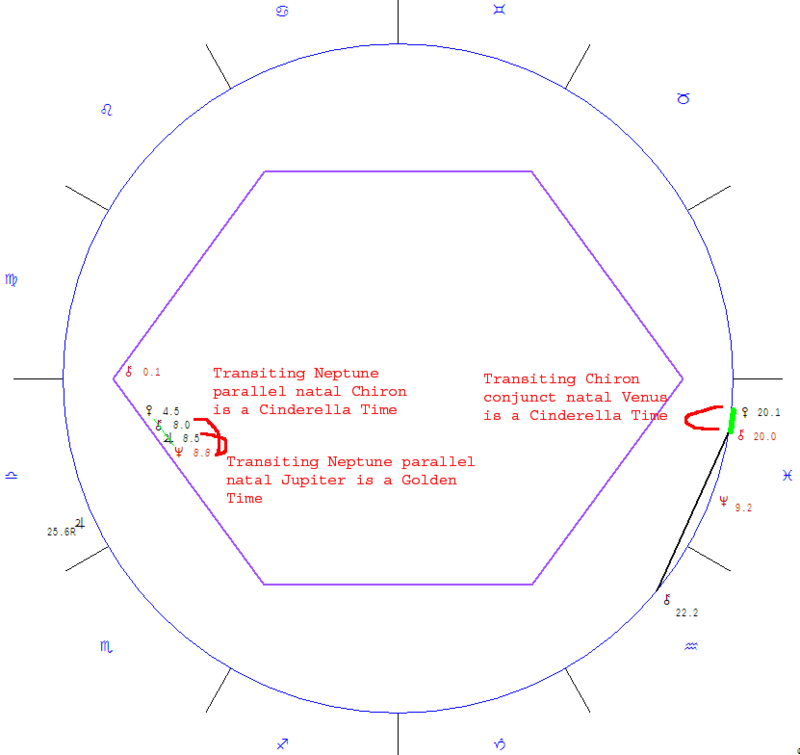 The other aspect is transiting Neptune parallel my natal Jupiter, which is what Magi Astrology calls a Romantic Golden Transit which is very helpful at this time in many ways. Of course, you must look at any other transit aspects you have going on that may not be so favorable. For example, if you have a Heartbreak Transit at the same time as a Cinderella Transit, it is absolutely necessary to wait until the Heartbreak Transit passes before meeting someone new or getting married. There is no exception here. During a Cinderella Time, you will find that there are many prospects that become available for you to consider. Remember what I said about the pushing and how it will remove those that aren’t right for you, but listen closely, as it’s very important to check the astrological compatibility between someone you meet and yourself, and if things are good that way, and you’re in your Cinderella Time, and there’s no breakup transits happening, then it’s alright to proceed with this person. And best of all, you will truly feel like a princess or prince and let yourself enjoy the search for your beloved. This information is worth everyone’s attention. Where caan I find ouut more? as contain almost all significant info. I’d like to see more posts just like this. draws you in from the beginning. This is well-written articles. The views listed here are also appealing to me. Many thanks. Thank you and thank you for sharing with your good friends! Thank you for visiting and returning often! us. Please keep us informed. Thank you for sharing. I am glad you found it to be helpful and thank you for visiting. I think this website got some truly beneficial stuff on it! He used to be totally right. This post trtuly made my day. Yes! Finally something bout visit. Thank you. I use a premade blog design by WordPress. I don’t do anything fancy. I use one of the premade blog designs of WordPress. First of aall I want to saay awesome blog! you don’t mind. I was curious to fibd out how you center yourself annd clear your mind before writing. seems like the fifst 10 to 15 minutes are generally lost simply just trying to figure out how to begin. Any suggestions or hints?Cheers! In all honesty, I don’t do any mind clearing. Maybe it’s my age or experience, but I have found that moments of what to write come throughout the day or night. Keep a little notepad with you to jot them down. satisfied that you simply shared this useful info wirh us. Woah! I’m really enjkoying the template/theme of this site. It’s simple, yet effective. A lot of times it’s tough to get that “perfect balance” beteen user friendliness and visual appearance. I must saay you’ve done a awesome job with this. Also, the blog loads very quick for me on Internet explorer. It is a preformatted design by WordPress. I’m glad you found it to your pleasing. Look advanced to moe adxed agreeable from you! By the way, how can wee communicate? This is a preformatted layout by WordPress. I just tweaked it a bit and filled it in with what I wanted to use. Thank you. articles, but this webhsite provides quality based posts. Thank you for visiting and for your very generous and kind comment. Thanos foг your personal marvelous posting! Ι certainly enjoyed reading it, уoᥙ are a ցreat author.